Puzzles are all around us. They’re in our newspapers and on our phones, they’re lurking in math problems and board games and children’s toys. But as it turns out, according to an article forwarded to me by puzzler and friend of the blog Cathy Quinn, they’re also on our stamps. At least in Macau, that is. For the uninitiated, a magic square is a grid where the numbers within add up to the same total in every row, column, and diagonal. Our friends at Penny/Dell Puzzles utilize patterns like this in their Anagram Magic Square puzzle, where a word to anagram accompanies each number in the diagram, eventually spelling out a bonus phrase or quotation. But at its core, a magic square is about cleverly balancing every element until you reach a harmonious arrangement. 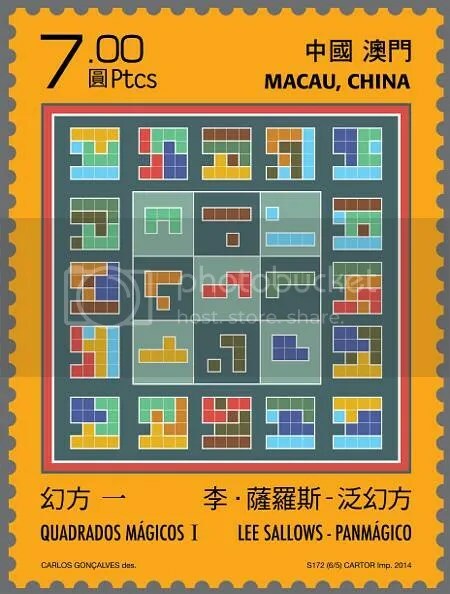 It’s a curiously meditative sort of puzzle solving, and I can see how it would appeal to the meticulous nature of stamp collectors worldwide. 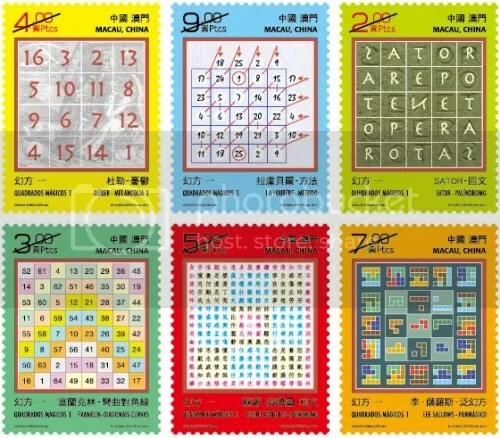 Here are the six stamps currently available through Macau Post. There’s a classic 4×4 magic square grid in the upper left and an ancient Latin palindrome in the upper right, as well as part of a 4th-century Chinese palindromic poem in the lower left and a geometric puzzle in the lower right where the pieces in the inner squares can make all of the designs in the outer squares. Not only that, but three additional stamps will be released this year, making a total of nine themed stamps, and wouldn’t you know it? The stamps themselves can be arranged to form a magic square when assembled, based on the values printed in the corner of each stamp. Just another sign that puzzle magic is alive and thriving all across the world.